Over the last three decades, researchers and equipment manufacturers have been pushing MR machines toward higher field strengths. When introduced in the early 1980s, most clinical magnets operated at 0.5T or less. Today, most clinical magnets operate at 1.5T and many at 3T. About 10 facilities in the United States and a similar number around the world operate 7T magnets. Ohio State University has had an 8T magnet since 1998, and the University of Chicago has a 9.4T magnet. “A couple of groups, including ours, are starting to think about 11.74T (commonly rounded to 12T),” says Gregory Sorensen, MD, codirector of the Athinoula A. Martinos Center for Biomedical Imaging in Charlestown, Mass., which has owned a 7T magnet since 2002. The super–high-field magnets have several advantages. Most importantly, images can be acquired at higher resolution, allowing users to study anatomical and functional features in finer detail. “It helps us detect smaller effects not visible at low field,” says Peter C. M. van Zijl, PhD, a professor of radiology and radiological sciences at the Johns Hopkins University School of Medicine and the director of the F. M. Kirby Research Center for Functional Brain Imaging at Kennedy Krieger Institute in Baltimore, which is currently installing a 7T magnet. Magnets at 7T or higher also allow for the improved detection of several chemicals, such as the neurotransmitters glutamate and gamma-aminobutyric acid, van Zijl says. In addition, he says, higher field strength allows for the more accurate detection of physiological parameters such as blood flow. Human research studies are underway concerning the effectiveness of higher field MRI. The door was opened to human research studies in July 2003 when, after numerous safety studies were published by Ohio State researchers, the FDA raised the limit of field strength associated with no significant risk to 8T. “While the FDA has said that up to 8T is considered a nonsignificant risk device, no manufacturer has yet released a 510(k) FDA-approved 7T instrument, although there is talk that at least one manufacturer will be doing that,” Sorensen says. Most of the current research using ultra–high-field magnets is on brain-related disorders and diseases such as Alzheimer’s, multiple sclerosis (MS), Parkinson’s, stroke, brain tumors, seizures, epilepsy, and traumatic brain damage. The real challenge is to find those areas where the improved spatial and contrast resolution at 7T makes a clinical difference, says Jeffrey L. Creasy, MD, an associate professor of radiology and radiological sciences and the program director for the Neuroradiology Fellowship Program at Vanderbilt University Medical Center in Nashville, which has a whole-body 7T magnet. “We have tended to concentrate on areas where we think those two things would matter,” Creasy says. Creasy says high-field scanning of the brain does appear to show details such as plaques that couldn’t be seen with lower fields. But, he says, it’s too early to tell whether that will translate into earlier diagnoses and better treatments for patients. “I suspect we will be proven correct, but only time will tell,” he says. • With a 4T magnet, researchers at the University of Cincinnati led by Stephen M. Strakowski, MD, are using it to study brain disorders, including bipolar disorder. They want to better understand how to identify this brain disorder earlier, with the goal of preventing disease progression. “We are one of the top sites in the world for the study of bipolar disorder,” Strakowski says. In 2007, the center received a $9 million, five-year grant from the National Institute of Mental Health for its bipolar research. The researchers are using functional MRI (fMRI) and MR spectroscopy, a technique used to measure the locations and amounts of specific brain chemicals based on their magnetic properties, to study what bipolar disorder looks like in the brain, particularly in response to different treatments. The researchers are able to integrate their high-field magnet with their electroencephalography (EEG) system. “So we can get functional imaging and EEG at the same time,” Strakowski says. This allows the researchers to combine the superior spatial resolution from their high-field magnet with the temporal resolution offered by the EEG. “That’s pretty unique,” Strakowski says. They use the integration of these two methods to study epilepsy. • Approximately 100 researchers are ready to use the 7T magnet at Johns Hopkins’ Kennedy Krieger Institute to study a variety of conditions and disorders, such as attention-deficit/hyperactivity disorder (ADHD), reading disabilities, Alzheimer’s, MS, autism, cancer, and stroke. Some of these researchers, van Zijl says, are interested in high-resolution, pathologylike imaging, while others are taking advantage of the brain chemicals or metabolites that the scanner can image. “For instance, some will be looking at disorders of the brain where glutamate levels are different,” he says. The Kennedy Krieger Institute, where the magnet is located, specializes in studying brain function in children with developmental disabilities. “If we can look at higher resolution of brain structures, we might find out more about the origin of conditions such as autism, ADHD, and reading disabilities,” van Zijl says. That information could eventually lead to possible treatments and/or prevention. Researchers at these centers, as well as others, are also studying the use of high-field magnets for brain surgery planning. They use the super magnets to create detailed maps of their patients’ brain functions to determine which areas control movement, vision, or language and then use the maps to avoid those areas during surgery. Studies at Vanderbilt have already shown the advantages of performing fMRI at high field because the spatial resolution achieved is much finer and the functional architecture of the brain is revealed in finer detail, says John C. Gore, PhD, director of the Vanderbilt University Institute of Imaging Science. Some researchers are also using their high-field magnets for sodium imaging of stroke patients’ brains. The results are useful for determining whether the brain tissue is alive or dead. This is important because if the tissue is alive, the patients may benefit from receiving tissue plasminogen activator to dissolve the clot. High-field sodium imaging may also be useful for determining the effectiveness of drug treatments for brain cancer patients. Researchers at Vanderbilt have already used the 7T magnet to study some joints and muscles of the extremities, Gore adds. They also have shown how carbon-13 MR spectroscopy can be used to follow the conversion of glucose into other metabolites with excellent sensitivity and time resolution, opening up the possibility of performing metabolism studies. Researchers at the University of Cincinnati have begun to use their 4T magnet to study the breast. “We’re working with one of the interventional radiologists here to see if we can use spectroscopy to identify the likelihood of a tumor being malignant,” Strakowski says. “If we are able to tell from imaging whether a tumor is malignant, it would decrease the risk of having to have a biopsy.” However, Strakowski cautions, the research using high-field MRI on the breast is preliminary. In the old days, he says, researchers would allow themselves a healthy margin of error and could still image what they wanted. Now, he says, researchers are trying to determine the safety limits so that they can get maximum MRI performance without harming patients. As the studies continue, super–high-field magnet scanning may prove to be an alternative to imaging done with PET or CT. The advantage to the high-field MRI would be that it doesn’t involve ionizing radiation. 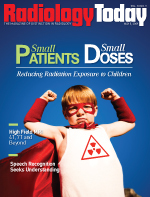 Thus, Sorensen says, studies could be repeated without the worry of the patients reaching their lifetime dose of radiation, which has become a prominent concern.